Today is the first in our series of How To posts for caring for, storing, and installing various sign products and materials. Today we're looking at Vinyl Banners. It's best to clean your banner with a soft cloth and water only, with minimal pressure and rubbing. For stubborn stains you can use a mild detergent. Never use anything abrasive, or with any harsh chemicals. Roll up your banner, on a tube preferrably, with the image facing in if digitally printed, or image facing out if cut vinyl was applied. Never fold the banner. This will leave creases in the material. Leave us a comment if you have any tips or suggestions. We're always happy to hear from you! 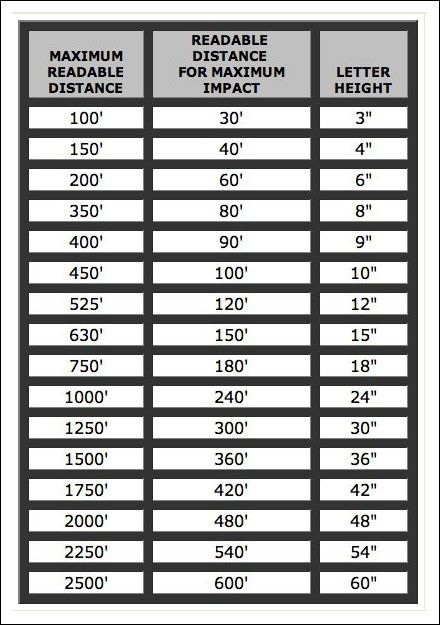 This is a letter height visibility chart pinned on our Pinterest page. It is a reference detailing recommended letter height for signs based on distance from a sign. 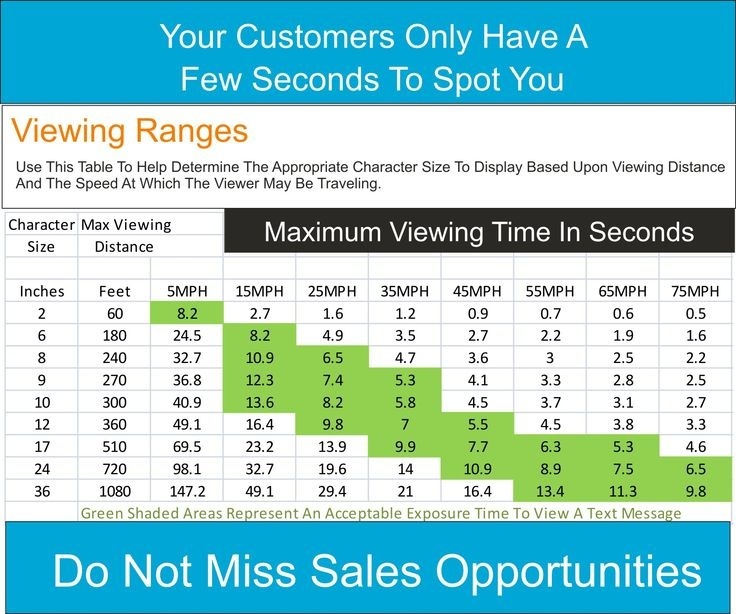 It lists the absolute maximum distance you would be able to read the text as well as the recommended max distance before the text loses impact. This is a similar graphic. It compares speed someone is traveling to letter height, to provide text height recommendations. As you can see, there are many options to consider when choosing the right sign for your next project. Sign Authority can help. This is a full wrap we did recently on a trailer for an entertainment provider installer. The wrap features a catchy blue background with the company's brand and contact information prominently displayed. We worked closely with the customer during consultation and design. They were very pleased with the finished product. Another successful project in the portfolio. As always, leave us a comment and let us know what you think! Here's an example of a perforated vinyl installation we finished today for Crown Trophy in Plano. This product allows for full color graphics on the exterior, but retains fully visibility from the inside. Below is a list of links we have compiled for sign permit applications, fees, codes and ordinances in the north DFW and Collin County area. 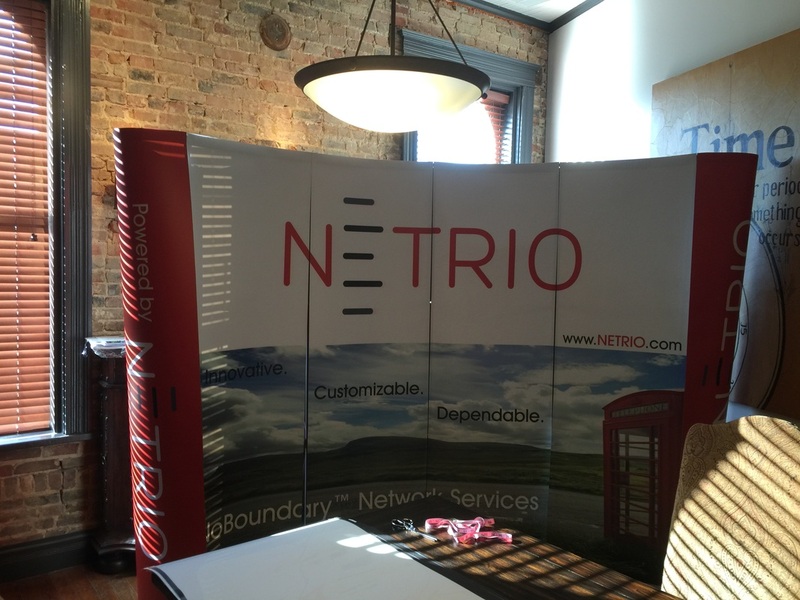 Here's an example of trade show graphics we did recently for Netrio in McKinney, replacing the skin on this four panel concave display. The graphics are mounted on durable PVC backer with matte over-laminate. The design is simple but bold, with the company's branding predominantly displayed. Another satisfied customer. Sign Authority, Inc. is a full service custom sign shop specializing in banners, vehicle graphics, vehicle wraps, interior and exterior signage.